1.67 And 1.74 High-Index Lenses: Why Do People Wear Them? You Are Here: Home » High Index Lenses » 1.67 And 1.74 High-Index Lenses: Why Do People Wear Them? Has anyone ever really liked wearing the thick and heavy lenses? Those lenses have never really been in style and it is probably safe to say that those lenses will never be in style. The good news is that improved lens technology has helped make significant improvements to eyewear, and no one has to be forced into wearing thick and heavy lenses. We are sure you have heard plenty about high-index lenses, whether it is 1.67 high-index lenses or 1.74 high-index lenses. You will hear those words often if you have worn eyeglasses for years or you are new to wearing eyeglasses. These lenses are thin and light which means you will be more comfortable wearing these than other lenses. You will also love the aesthetics. In earlier years, if you were given a strong prescription you were expected to wear heavy lenses. This is no longer the case. Thick lenses are no longer associated with strong prescriptions. Before high-index lenses were available regularly, people who needed strong prescriptions would have to wear glass lenses. That does not sound like something that would be safe, right? Well, that is because they are not. If the glasses would break or crack, pieces of glass could get into your eyes and cause more damage to your eyes. Now, you do not really hear people asking for glass lenses because they are not as common as the newer lenses. Who May Be Prescribed High-Index Lenses? If you are short-sighted, long-sighted, or if you have astigmatism, you will see wonderful benefits from wearing high-index lenses. Typically, if you have a high prescription, your lenses will need to be thicker. If you are short-sighted, you can expect to have lenses that are thicker on the edge. If your frames are big, then you can expect your lenses to be wide. 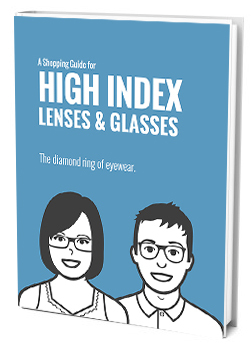 Thankfully, high-index lenses will not make your lenses look thick around the edges. If you have been given a strong prescription because you are long-sighted, you can expect to have more thickness in the center of the lenses. Thankfully, there will be no more of the “bug-eyed” look because your lenses will be flattened. Why Do People Wear High-Index Lenses? There are a variety of frames and styles that are perfect for those wearing high-index lenses. It does not matter what type of frames you prefer to wear, you will have the opportunity to wear those thin and aesthetically pleasing high-index lenses. If you want to wear frames with no rims, you will be able to wear high-index lenses. You will not have to worry about your lenses being exposed because the material that is used in high-index lenses does an outstanding job of protecting your lenses from shattering. These lenses are very resistant. We have talked about how high-index lenses are great if you have been given a strong prescription, but some people will find that these lenses reflect plenty of light. Some people may not find this to be bothersome, but others will. Thankfully, you can add an anti-reflective coating to your lenses so you can reduce the problem of light reflection. You will be surprised at how much light the coating will cut. If you know that you need eyeglasses or if you know it is time for you to book another appointment, you should not hesitate to do so. There are plenty of resources available online and in your nearest eye doctor’s office.